Agnes, lived at 187, Bridgnorth Road, Wollaston and was not a member of our congregation. As far as we know she never worshipped at Holy Trinity. Anecdotal evidence suggests that she was a patient in the nearby Corbett Hospital and whilst there was able to hear the then single bell. She was, we believe, visited in hospital by the Incumbent Reverend Leonard Budge who was at Holy Trinity from 1958 until 1964. Agnes appointed Reverend Budge (or any subsequent Vicar of Amblecote) and George Leslie Penn as her Executors and Trustees of her will. She left a legacy to provide a stained glass window, a ring of eight bells and money to set up a housing fund. She left money to provide a stained glass window on the South side of the Church in memory of her late mother Orpah. The window space having being reserved by the Reverend Leonard Budge. She requested that the window should be similar to William Holman Hunt's painting 'The Light of the World'. What was finally produced, though a fine window, shows little resemblance to her request as it is a representation of Saint Francis of Assisi. Whether her idea was seen to be technically difficult or just out of keeping with the other windows we do not know, but what is certain is that she did have a great love for animals and if for that reason alone it would seem to be appropriate. The window was manufactured by John Hardman and company and dedicated in 1965. Agnes also bequeathed money to provide and install a peal of eight bells of medium weight. She had the foresight to request the installation of an apparatus to permit the bells to be chimed by just one person when ringers are not available. These bells are carefully maintained to this day and rung on most Sundays and by teams of visiting bell ringers from various parts of the country. Her third and final gift to the people of the parish was to establish the 'Agnes Egan Housing Fund' which provides four bungalows for aged widows, spinsters or married couples who have resided in the Parish for at least twenty years and are members of the Church of England. The Parochial Church Council of Holy Trinity is able to appoint Trustees to this fund. Agnes was specific in that the fund was not to be a Charity, the occupants were to pay their way, as she wrote:- 'Life has taught me that what is free is not always appreciated'. 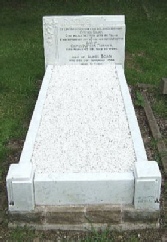 In item 5 of her will, Agnes left the sum of £300 to be invested and the income provided to enable her grave to be kept in good order. There is considerable doubt that this money was ever received by the P.C.C. and in recent years her grave began to look tired and was starting to fall apart. With the winding up of her Trust Fund a small amount of money became available and the P.C.C. agreed that it was incumbent upon it to try to adhere to her wishes and the grave has been beautifully cleaned and restored.